In other news, this is probably the first strip where I actually drew Mordred his proper height. He’s a good two-three inches taller than Wiglaf…heh. I like the inclusion of this Cavalier song….I have to remember to look up the song and read the rest of it some time. These lyrics are great: “There’s neither swallow, dove nor date,/ Can soar more high or deeper wade.” Very cool. I love the fact that we see Brat and Driver actually speaking to each other for the first time. And the sickened, horrorstruck looks on Mordred, Brat and Driver are awesome. Another indication that this Janus is truly a holy terror. “Hold me! Oh God! I feel it! She’s here!” Hehehe Says it all! So Mordred is more afraid of Janus than Arthur, huh? Well, that does set the bar pretty high for Friday, especially since Arthur’s brother complex is scary in its own right. Fear Janus, the ultimate smotherer! I do so love the expression on Mordred’s face. I just wish there had been more of a transition between panels. You have Janus singing and getting closer and then Mordred’s panic. There’s no moment where we see him actually pause to identify the threat. Ooooh, or maybe his senses are just THAT good. Mordred’s panic is priceless. :D I’d bet Janus trampled his roses and burned his poems when he was young to scar his psyche. Hmm… blue background for Janus, so she’s probably still on asphalt yet. Green background for the other four, so they’re just a touch out in the wilderness. Everyone meets back at the camp, right? Ah, Janus is going to be so much fun. 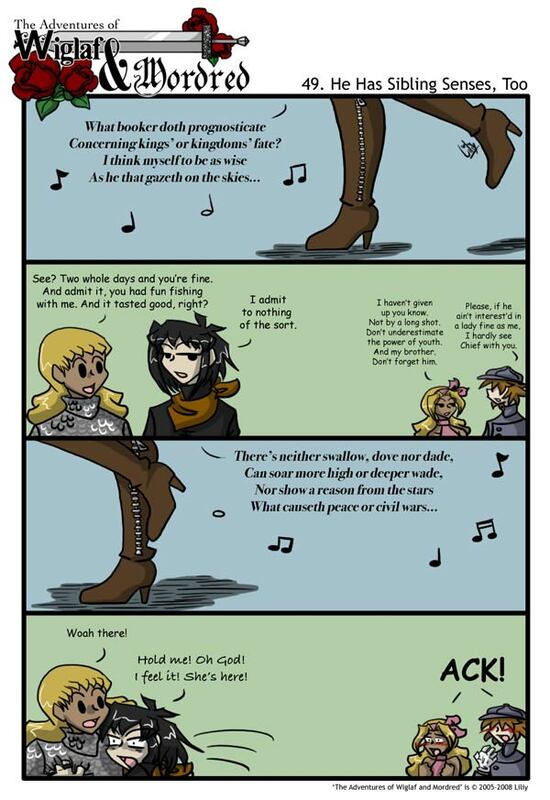 XD I love her panels, and the song. This is a great suspense-building strip. I’ve just finished reading up to this point. I really like this comic! It’s so fun to read and I love the characters! Mordred’s sudden terror is just awesome. Not that I have anything against him, mind you. I just love how his sibling senses are instantaneous. He’s all calm and collected one minute, and then BAM! He’s having a mini-heart-attack. Poor guy. ^__^ I look forward to the next page! The last panel is perfection. I love Driver and Brat’s reaction to Mordred grabbing Wiglaf. i find it amusing that the girls are blushing so much. no matter how much they love a boy, :happy: girls just can’t deny how cute it would be if they were gay. I love the last panel so much. For both the humor and the joy it gives my inner fangirl to see Mordred clinging to Wiglaf.